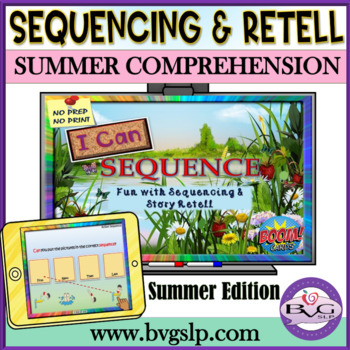 BOOM CARDS Speech Therapy Boom Cards for Sequencing: This is a comprehensive NO PREP, NO PRINT Boom Card Activity that addresses the concept of Sequencing and Story Retell with a SUMMER THEME. It includes full-color, high-resolution images and is fully interactive with point & click and drag & drop features with immediate feedback provided. These cards are self-grading and are a fun engaging way to address a wide variety of concepts: sequencing, story retell, answering wh questions, auditory comprehension, reading comprehension, vocabulary, and literacy. 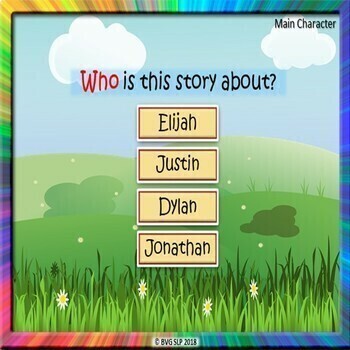 It includes four separate short stories with comprehension questions and visual supports to aid in increased independence with story retell. This lesson includes a total of 55 full-color slides and can be played on Smartboards for whole group instruction, computers, tablets/iPads for small group and 1:1 individual learning, and speech teletherapy, telepractice (via Site/Screen Share) platforms for interactive remote sessions. 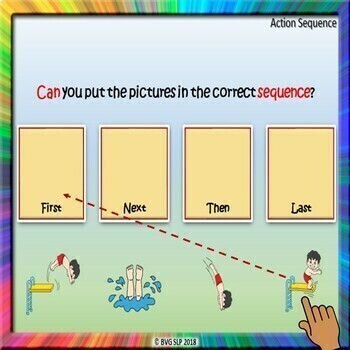 If you like this unit, please take a look at my "Boom Cards: Sequencing and Story Retell Fall Edition", "Boom Cards: Answering Yes/No Questions", "Boom Cards: Shapes and Colors Galore", "Boom Cards: Category Sorting Fun", "Google Digital Interactive Notebook:All About Me, "Google Digital Interactive Notebook Objects and Functions", "Google Interactive Following Directions", "Spring into Language", "Multiple Meaning Words", "Animated Vocabulary", "Same or Different", "More or Less", "Rhyme Time", and "Can You Describe That" lessons which are great accompaniments to continue teaching important foundation skills.